During our Thanksgiving visit to Basel, Switzerland, we stayed at Hotel Bildungzentrum 21 or Hotel Educational Center 21. 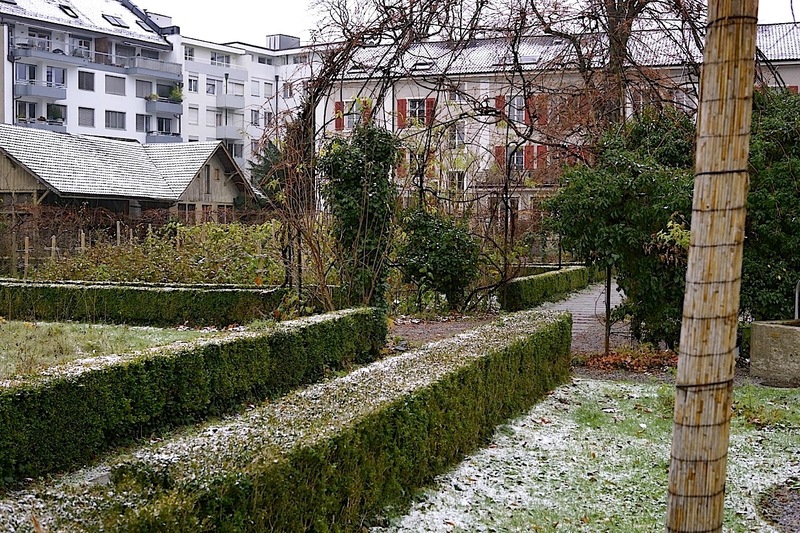 Although a large garden was mentioned on TripAdvisor when I was booking, I had guessed that this would mean — particularly in late November — neat gravel paths, some dormant shrubs and lawn, and beds of chilly purple pansies on a 8″ planting grid. That the “private park” would actually encompass meadows, large plots for flowers, vegetables, and herbs, rows of berry bushes, and an orchard was a wonderful surprise. The hotel’s rooms are in one part of a building constructed in the 1860s as housing for the Basel Evangelical Missionary Society, now called Mission 21. 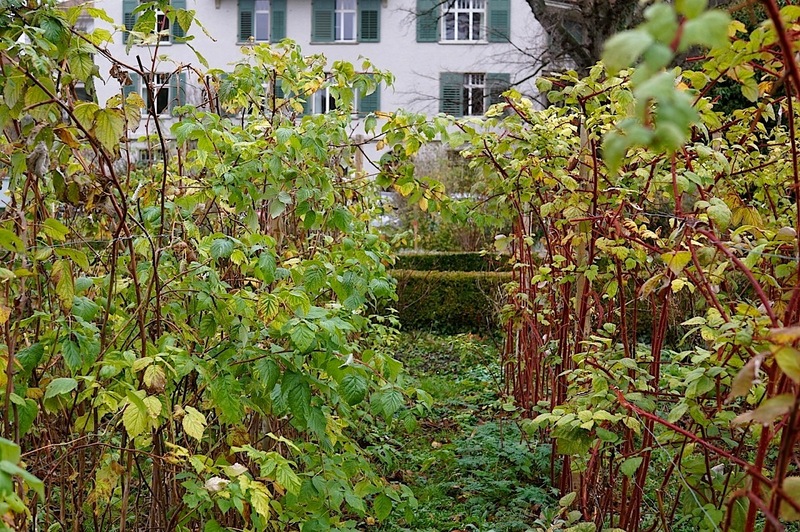 (Hermann Hesse lived here for six years as a child.) The garden was once a place for teaching outgoing missionaries how to grow their own food. 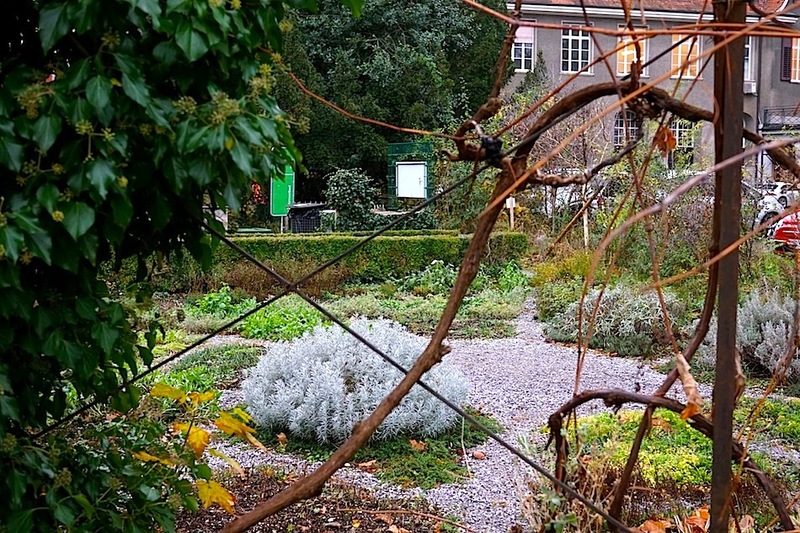 Today, it is cared for by Unigärten Basel — a collective of University student gardeners — in collaboration with Urban Agriculture Basel and ProSpecieRara. 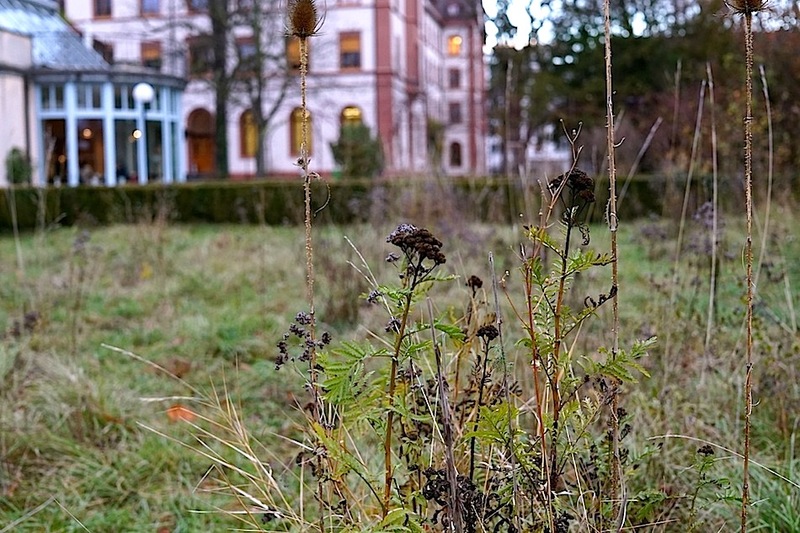 Unigärten’s goal for the Mission 21 garden is to show the “greatest possible diversity of plants” within a permaculture system. 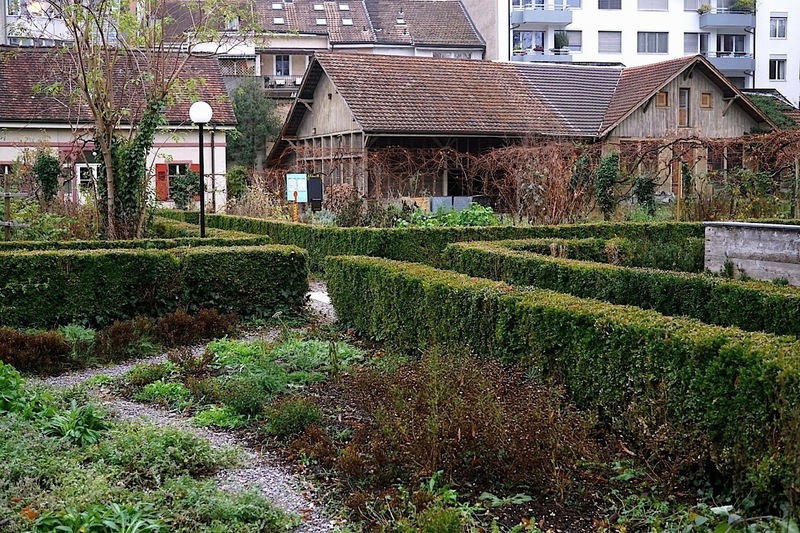 They believe the garden, open to hotel guests and the surrounding neighborhood, can inspire both experienced and novice gardeners. In the back garden, seven rectangular and square sections are outlined in sheared boxwood. 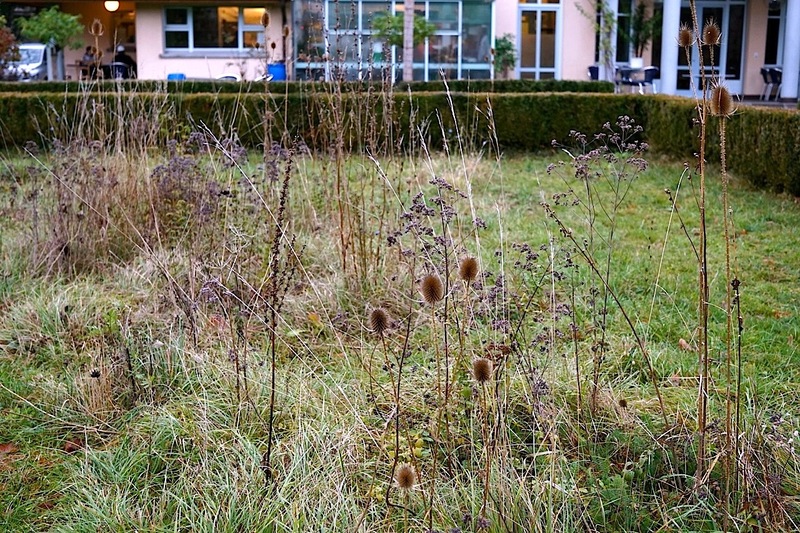 Wild plants (Wildpflanzen) — particularly those that thrive in dry and waste or disturbed ground (Ruderalflächen) — take their place alongside the urban agriculture. 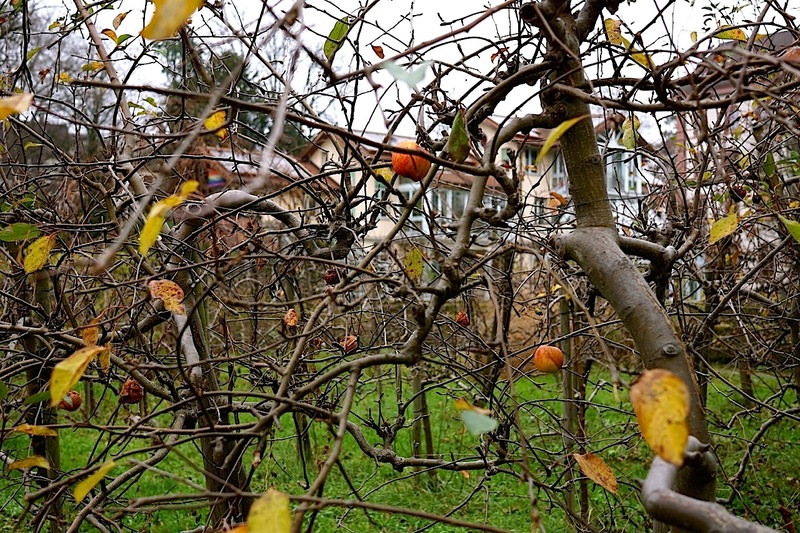 They have been left to spread largely undisturbed along the pathways and under shrubs and fruit trees. And in the two meadows, there are forty species, “providing joy to many insects,” according to a sign posted outside the restaurant. The front garden, across from the hotel entrance, does contain curving gravel paths and lawn, but also a number of large, old trees underplanted in a very rough and natural way with native plants from the region — mostly those with the downy oak forest as their native habitat. You can also see that this front area has been designed to accommodate the hotel’s and the Mission’s entertaining needs and is surely at its best in the warmer months, full of tables and chairs, lights, and people. Hotel Bildungszentrum 21 is two blocks from the historic city center. The rooms are simple, but comfortable. Their rates are very reasonable. Meals are the biggest expense for a tourist in Basel. Main dishes in all the guidebooks’ lists of budget restaurants are $20-$45. A Whopper meal at the local Burger King is around $15, although sandwiches from bakeries, eaten standing up, can be had for $6 – $10. I can recommend Zum Isaak and the bistro of the Museum der Kulturen (nice for lunch), both on Münsterplatz; Manger & Boire at Barfüsserplatz; and ONO deli cafe bar at Spalenvorstadt and Kornhausgasse (their generous Zmorge breakfasts are good for lunch too). All public city transportation is free for anyone staying in a Basel hotel. Just ask for a pass when checking in. Click on any thumbnail in the gallery below to scroll through full-size images. Looking down the central axis to the hotel building. On the left: compost area, herb garden, restaurant. On the right: vegetable/flower garden, berry rows and orchard, and meadows. English daisies and other plants in the turf. In front of the hotel restaurant. The meadows seen through the grape arbor. Half these areas are meadow, half are mowed. A dusting of snow on our last day. Forty species of wild plants in the meadow. Beneath shrubs, paths,. . .
. . . and vines, wild plants grow uncut. The area between the hotel and the restaurant. A sign outside the restaurant explaining the presence of over native plants in the garden. The meadow seen from inside the center arbor. The walkway at the back of the garden. The hotel and Mission 21 building. I suspect there was once a Victorian rock garden here. Almost ten years ago, this area was redesigned to highlight the old trees. A few zinnias holding on. What a gorgeous surprise. So much color for Nov. 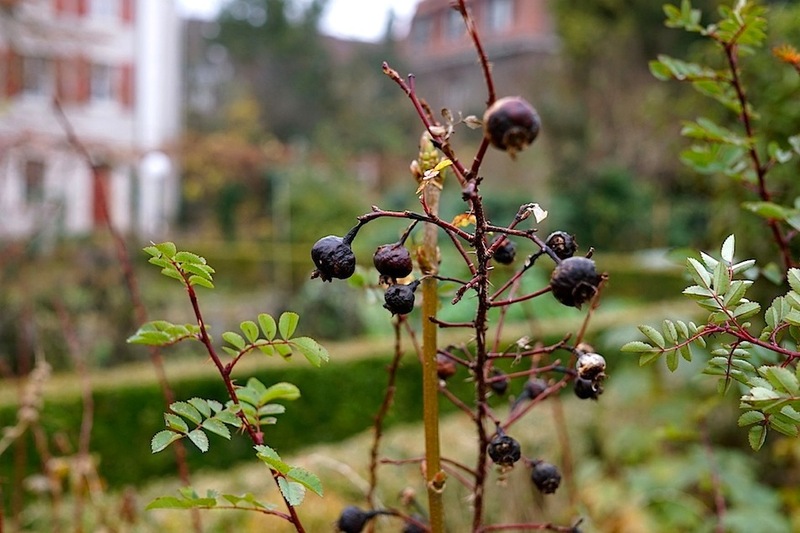 The vines, berries, hedges – something everywhere you look. 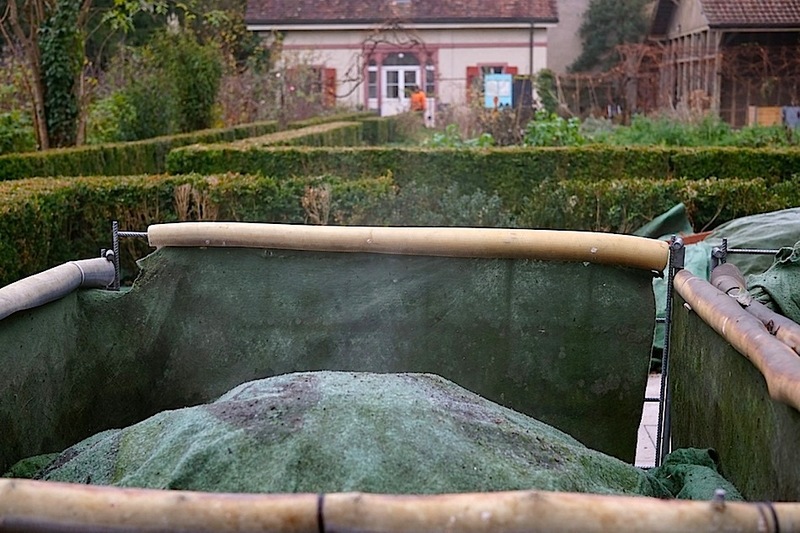 We’ve had a relatively warm fall and winter in southern Germany — and Basel is right on the border. But I think it’s also because of their good gardening techniques.